Our full-service resort offers group-friendly amenities and facilities for business meetings, social events, family reunions and weddings. We offer a wonderful selection of venues to host your special event, ranging from our beautifully manicured gardens, pool terraces, restaurants to indoor meeting and banquet facilities for up to 80 guests. Many of our facilities boast spectacular ocean views. Pueblo Bonito Mazatlán also offers complete catering services, state-of-the-art audio/visual equipment and systems, simultaneous translation services, telephone ports, high speed Internet access and a complete business center. 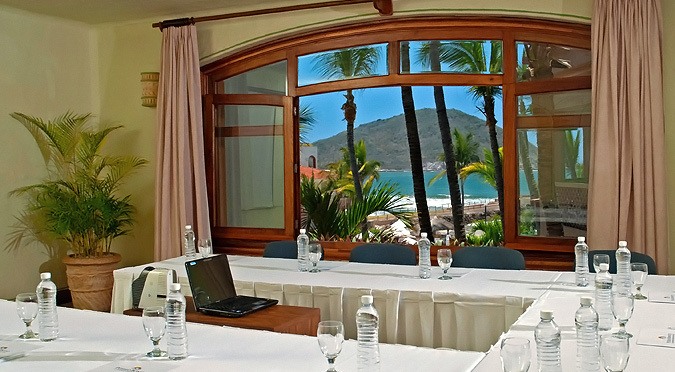 Our stylish meeting spaces include the 117-square-foot Las Fuentes room and the intimate 40-square-foot Mazatlán Meeting Room.